1st: because I though that it was a lovely red wine, quite juicy, with good acidity, a touch rustic with some tannins toward the end, but overall really enjoyable and definitely food friendly, and more especially not overripe or overdone like some Languedoc wines can be (sometimes). 2nd: because, this nice wine is made with 100% Cinsault which is definitely not a common thing to see or taste, and I was really intrigued and surprised to find such a rare and distinctive wine that good at this price (under $15). Cinsault (also spelled Cinsaut) is a red grape variety, whose heat tolerance and productivity make it very important in the Languedoc-Roussillon region, where it excels when blended with Grenache and Carignan, but also in Algeria, Morocco, Lebanon, South Africa and California. As part of a classic Languedoc-Roussillon blend, Cinsault brings juiciness, brightness, structure and tannins while Grenache bears most of the fruit, softness, opulence and the aromatics, and Carignan complements the texture, the roundness and also some of the features through out the flavors in the palate. Although, it is said that Cinsault originated from the Hérault district, near Beziers, in the Saint-Chinian region to be more precise, it may have been imported a long time ago from the middle-east, where it is still widely cultivated. As an example, Cinsault has always been one of the main components in the blend of Château Musar (see my previous post on Château Musar). Cinsault has many synonyms, one of them (and probably the most confusing) is called "Oeillade" and is sold as a table grape, although it is different from the ancient and "true" Oeillade which is no longer cultivated. In South Africa, it was known and bred as "Hermitage", hence the name of its famous cross created in 1925: South Africa's pride "Pinotage", a cross between Pinot Noir and Hermitage (Cinsault). After Languedoc-Roussillon, South Africa is somewhat the 2nd house of Cinsault. Until about 5 or 10 years ago, Cinsault bottled on its own was nearly unseen and for most producers quite unthinkable. However, better technology and multiple experiences but also soil studies and partly global warming (I obviously mean: increase of temperature and longer ripening season), combined with skilled winemaking techniques, allow us to find more interesting wines made from grape varieties that were only believed to be small part of a blend or even sometimes nearly instinct. And trust me, this kind of wine really triggers my attention and interest. CVNE Contino Graciano and Santiago Ijalba Graciano: two great, earthy red wines made with this red grape variety called Graciano that has always been blended with Tempranillo in the Rioja region predominantly. Here again, due to daring and talented winemakers who believed in the Graciano grape, but also due to the cited above reasons, we can now find Graciano bottled on its own (see my previous post on Contino where I described in further details my experience with the wines of Contino and my meeting with the master winemaker behind them: Jesus Madrazo). Cinsault is now a part of the list of these ancient grape varieties that were put aside for a while and nearly forgotten for some, which are now experiencing a renaissance and expressing the true characteristics and unique flavors of their Terroir of origin. Domaine des Terres Falmet was established in 1996, in the little village of Cebazan, located southeast of Saint-Chinian (north of Narbonne and west of Beziers). The Domaine encompasses 25 hectares of contiguous vineyard plots planted on hillside with excellent sun exposure. The young and talented Yves Falmet, owner and winemaker, produces this well crafted Cinsault from vines that are more than 50 years old planted on very rocky, clay-limestone soil, so the resulting wine combines, character, length and depth with juicy fruit, mineral and good tannic structure. Moreover, with no filtration or no fining, this wine didn't lose any of its personality or varietal character. 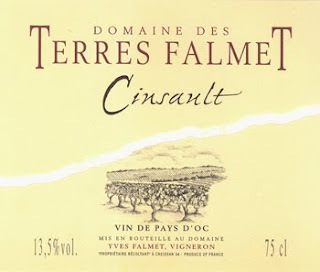 I loved the previous vintage, and think the 2007 Terres Falmet Cinsault follows the same profile, attitude and charm. The robe is clean, bright ruby red with light intensity. The nose is quite expressive and inviting, Garrigues-like with freshly crushed wild red and dark berries aromas, touch floral, earthy and mineral. Overall light to medium bodied, the palate is quite lush with darker berries flavors than the nose, like blackberry, ripe dark cherry and blueberry, nicely lifted by a great acidity which adds balance, freshness and juiciness, especially in the mid-palate. Calling for another glass, the lingering finish is dry and earthy, a touch spicy, with present yet integrated, soft tannins. Food friendly and an easy drinking, this intriguing and attractive little wine offers a complexity not often found in wines in this category. Pair it with grilled lamb Chops and veggetable Mediterranean dish like Ratatouille. You can serve it both room temperature or even slightly chilled, it has been flying off the shelves this summer. Due to the consistency and harmony of the last two vintages, Domaine des Terres Falmet and Yves Falmet deserve that interested amateurs and connoisseurs keep an open eye on this estate and its wines. Yves also produces an other beautiful wine produced in AOC Saint-Chinian, called: "L'Ivresse des Cîmes" (which could be translated by the "Dizziness of the Summits", just the name speaks for itself).